INDIANAPOLIS, Ind. 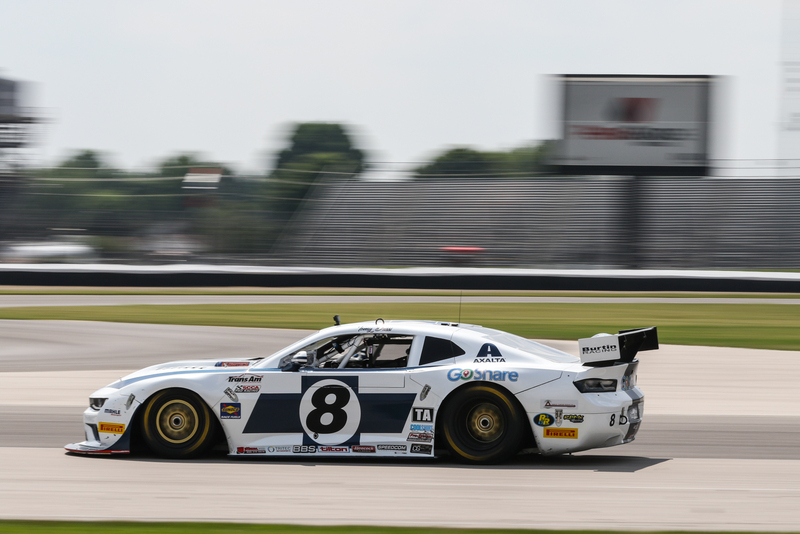 [June 17, 2018] – Ernie Francis, Jr., captured his third win of the 2018 Trans Am Championship presented by Pirelli today in the Berryman Trans American at Indianapolis Motor Speedway, completing a drive from the back of the TA class field to his second consecutive Trans Am win in Indianapolis. Joining Francis in victory lane celebrations was Tim Kezman with a redemptive TA3 class victory and Trans Am debutant Warren Dexter who swept all TA4 class sessions on the weekend. Trans Am’s West Coast Championship also participated in the competition, with Tomy Drissi and Dane Jorgenson-Smith taking class wins. The multi-class 102.06-mile race around the 2.43-mile combined road course saw machinery and drivers alike battle track temperatures in excess of 140 degrees and a slick surface at IMS. Other than a single hardship lap, the race was Francis’ first time in the No. 98 Frameless Shower Doors Ford Mustang this weekend; as the defending TA class champion took part in his NASCAR K&N East debut, capturing pole and finishing second at New Jersey Motorsports Park. Francis’ success in New Jersey came at a price, with the No. 98 starting today’s Trans Am competition at the back of the field in 13th position. The No. 98 would quickly move up through the field, taking advantage of the battles in front of him securing eighth position in advance of the first full caution four laps in, and third by the second on lap 16. Shortly after the second restart then race leader Lawrence Loshak was forced to pull the No. 2 Pennzoil/ ETE/ GoShare Chevrolet Camaro off with differential issues, yielding the lead to David Pintaric, in the No. 57 Kryderacing Cadillac CTS-V, who would led for a single lap before being overtaken by Francis. Francis would lead the caution-free remainder of the race, eventually building up a 34 second lead with four laps remaining before coasting to his second Trans Am win at IMS in as many years. Francis was joined on the TA class podium by Amy Ruman, in the No. 23 McNichols Company Chevrolet Corvette, who elected to pit under the second caution to adjust setup and in doing so fell back to 11th place. Ruman would then work her way through the field, capturing third place with five laps remaining and second position on the second-to-last. Tomy Drissi, in the No. 8 GoShare Chevrolet Camaro, would complete the podium with a third place finish and also secure the top TA class finish in the Trans Am West Coast Championship. Drissi was served with a drive through penalty while running second with nine laps remaining, falling back to fifth. A last lap pass of Simon Gregg, in the No. 59 Derhaag Motorsports Chevrolet Corvette, would secure Drissi a podium finish. David Pintaric and Simon Gregg would complete the TA class top five, finishing fourth and fifth, respectively. The TA class saw pole sitter Paul Fix, in the No. 4 StopFlex.com/Classic Tube Ford Mustang, and Boris Said, in the No. 21 SRI Performance/ Weaver Dodge Challenger, also led laps in a race that saw four lead changes and five different leaders. Tim Kezman’s TA3 class win in the No. 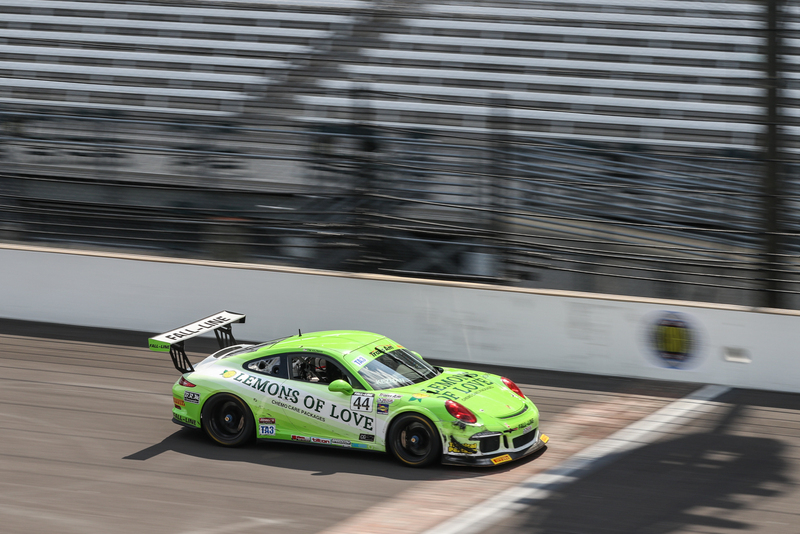 44 Fall-Line Motorsports Porsche 991 GT3 Cup finally brought him the Indianapolis lead that a flat tire denied him in 2017 with five laps remaining. In addition to the track conditions, Kezman weathered a back and forth battle throughout the early stages of the race, taking the lead from Cindi Lux, in the No. 45 Lux Performance Group Dodge Viper, on the 9th who had overtaken polesitter Mark Boden, in the No. 46 Fall-Line Motorsports Porsche 991 GT3 Cup, on the first restart. From the ninth lap on, Kezman would retain the lead, eventually capturing his first TA3 class win of the 2018 season and seventh of his career while finishing fourth overall. 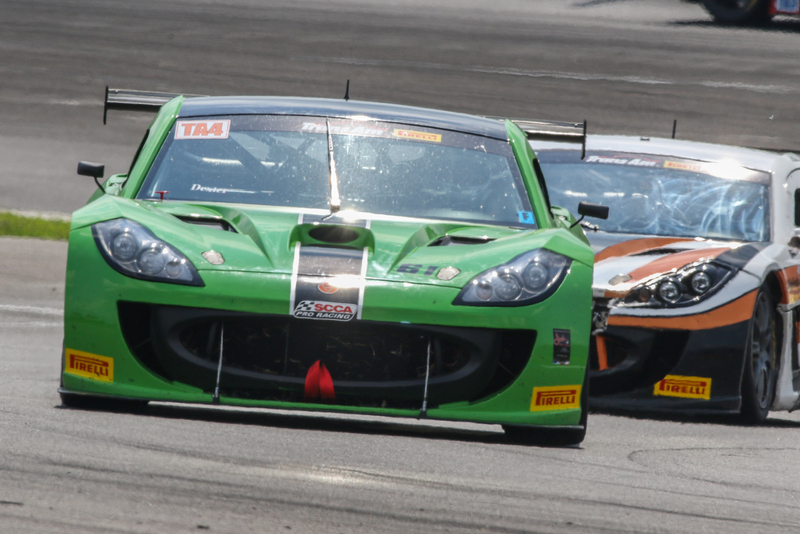 Mark Boden, who took second position in class on lap 13, would finish second in TA3 and fifth overall, giving the Fall-Line Motorsports team a 1-2 sweep of the podium while extending his own podium streak to his past seven TA3 races. 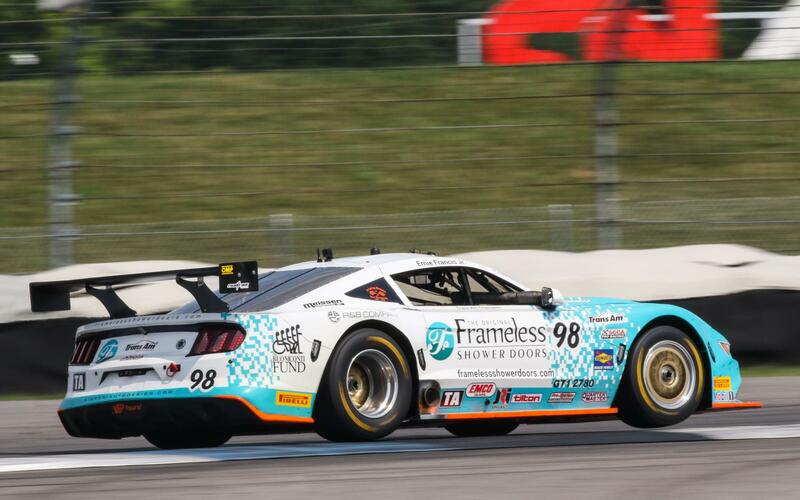 Cindi Lux would finish third in her 2018 Trans Am debut for her eighth career Trans Am podium finish in the No. 45; while Alline Cipriani, in the No. 60 Ginetta Cars Ginetta G55, and Carey Grant, in the No. 5 Sentry Self Storage/ Fairfield Inn Porsche 991.1, completed the class top five. In TA4, Warren Dexter, in the No. 61 Joe’s Hand Cleaner Ginetta G55, completed a dominate weekend that saw him lead every session, start from pole, lead every lap and capture the class win in his Trans Am debut. Todd Napieralski, in the No. 39 Chevrolet Performance/ SKF/ BSP Chevrolet Camaro, would finish second in TA3 in his season debut; his 33rd Trans Am podium finish. In TA4 West Coast competition Dane Jorgenson-Smith, in the No. 28 Bob Smith Motors Ford Mustang, beat out Joe Bogetich, in the No. 65 Westover Controls Chevrolet Camaro, for the top spot, securing Jorgenson-Smith’s second TA4 West win of the season. 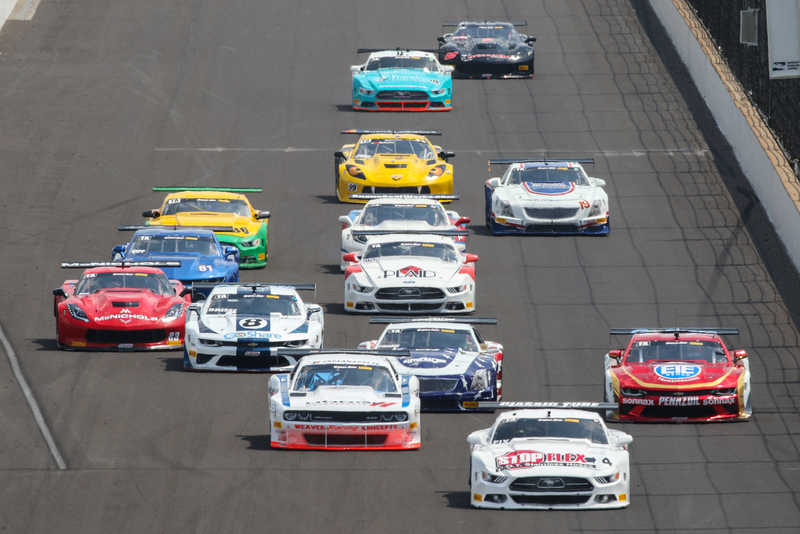 Trans Am’s TA2 class held a 102.06-mile race of their own yesterday, June 16, with Thomas Merrill taking the TA2 West Coast win and Jordan Bupp the TA2 Trans Am Series victory. Both Trans Am races this weekend will be showcased in a CBS Sports Network broadcast on July 1 at 2:00 PM ET. Replays of both race’s live streams can be also viewed on Motor Trend On Demand.